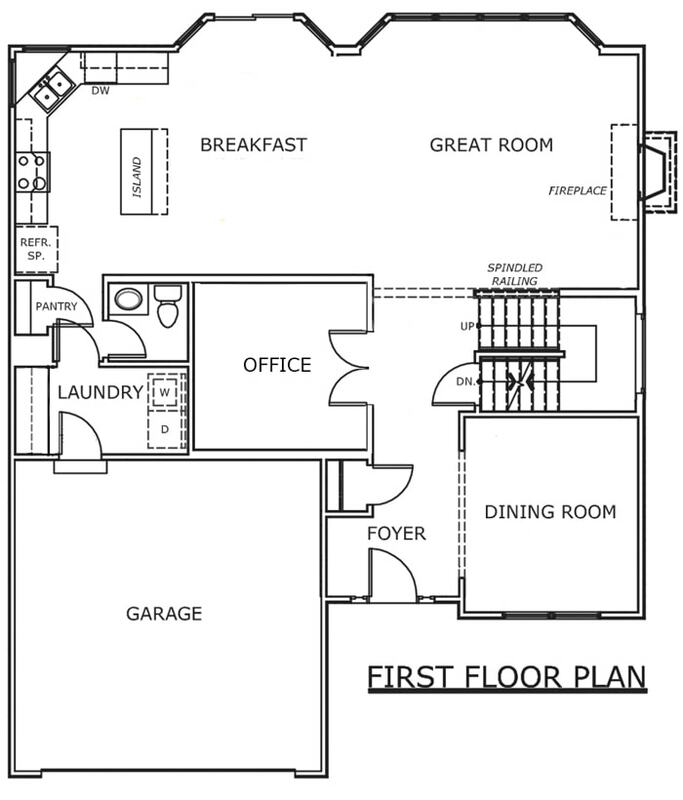 I thought today I would share the floorplan of our new home with you guys. It’s not a custom home that we designed ourselves, but a new home builder’s plan that we adjusted to fit our family’s needs. Basically the house is quite similar in layout to our current house, just about 1,000 square feet smaller. Now a bunch of that is because we are losing the sun room, but also because all of the rooms are just a tad smaller. I’m really going to miss my huge kitchen with oversized center island that sits 4 chairs, but I’m excited to gain a home office ILO a living room. So the office was actually supposed to be the dining room and what will now be the dining room was the formal living room. Confused yet? I basically just adjusted the layout; closed off the kitchen access to the “office” and added French doors. I know the new dining room location is far from the kitchen, but how often do we really use a formal dining room? Plus I wanted the bigger of the two rooms as my dining room (plus it has the window with lots of natural light, bonus). The second floor is pretty ordinary. Four bedrooms, two full baths. 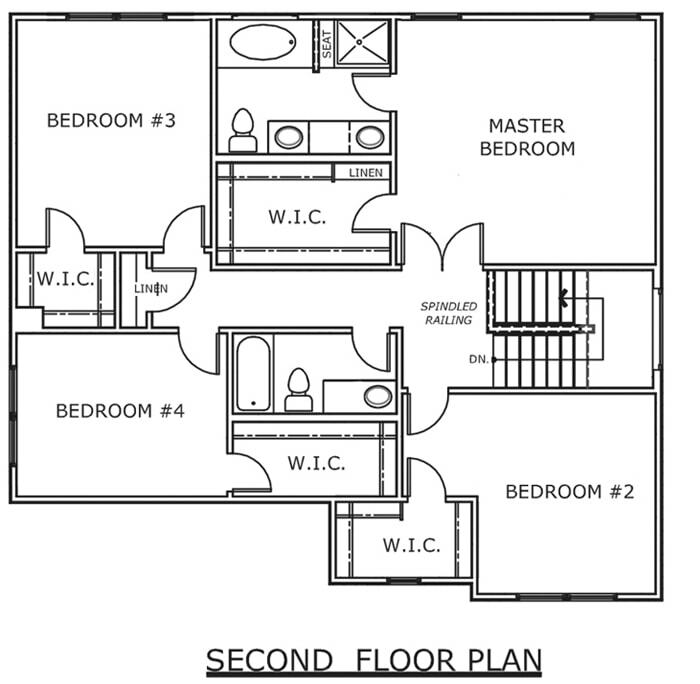 My favorite part is that all bedrooms have a walk in closet. My daughter will sure miss her bedroom stage, but I’m sure we’ll figure out something fun for her new bedroom. So what will we miss most from our current house floor plan? Well if you noticed, we’re going from a three car garage down to a two car garage. Looking at all of our bikes and lawn equipment and my Goodwill furniture, I wonder how we ever did without the extra storage. I’ll miss the sun room of course, but really we didn’t use it as much as we should have. I mean really, as a family of 3, how many living spaces did we really need? And my butler’s pantry. Oh, how I will miss this area in my home! 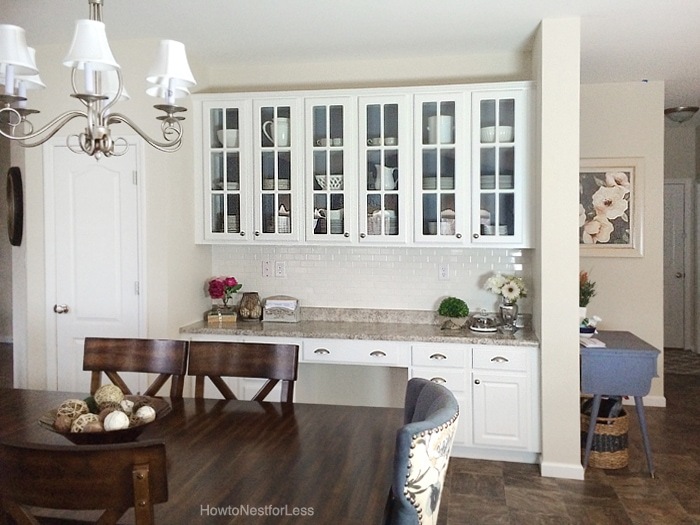 The glass front cabinets, the drawer space, the extra countertop space… yeah, it was amazing. Until then I still have a couple rooms to reveal from our current house. Laundry room is coming up next week! Just a suggestion, but I think you should make the door from the laundry room into the kitchen into a pocket door. That is a quite a few doors for such a small space and I think having one of them slide instead of open will be a huge benefit. I agree with the pocket door for the laundry/pantry/half bath area…. hope it can be fesible to eliminate a jam of doors! Just another suggestion – could you add another set of french doors in your office on the wall facing the breakfast nook? You would get natural light in there that way as well as for resale value, it could then be a dining rm that has kitchen access. Maybe the hallway french doors in the plan now could be another pocket door. That way it could be open or closed and it would be functional for whatever you or future uses that space for. You know… I have NO IDEA why they make you leave the curtains! 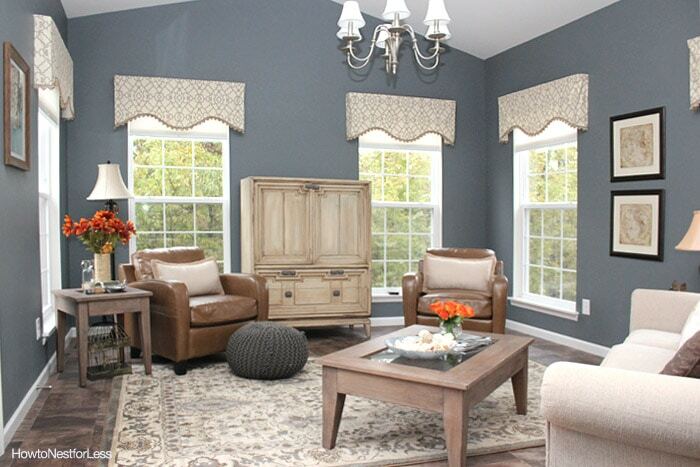 All window treatments are expected to stay behind though when you move. It’s usually an unspoken agreement, although sometimes the real estate agent will write it into the contract. Your agent will often recommend that you switch out the curtains before your house is put on the market if you REALLY want to keep your curtains!